What are 3G and 4G routers? A 3G/4G Router can be used to supply wireless internet access in areas where it might otherwise be unavailable. These routers are highly recommended for indoor/outdoor scenarios with poor download/upload speed! 3G and 4G is short for 3rd and 4th Generation, and are the technologies that supply Internet access to various mobile devices using cellular signal. 4G is faster than its 3G counterpart, with speeds up to 100Mbps. 3G and 4G routers have a wide range of applications that vary from providing internet for mobile offices and public transportation, to industrial purposes such as CCTV or heating and cooling in commercial transport. It’s even possible to manage machines and equipment effectively with status updates! Teltonika’s 3G and 4G routers have a range of uses and can offer remote solutions for a wide array of purposes. Teltonika’s RUT240 is a compact, powerful router that is perfect if you’re looking for a cost-efficient internet solution! This router can handle up to 50 simultaneous connections - balancing traffic over multiple WAN connections. The Teltonika RUT950 router is a highly reliable dual-SIM router ideal for industrial purposes. This router features connectivity redundancy and supports up to 100 simultaneous connections. External antenna connectors make it possible to find the best connection no matter where you are. The Teltonika RUT955 router is a dual-SIM router ideal for professional industrial applications. Like the RUT950 this router can handle up to 100 simultaneous connections, but this upgraded model has 4 x ethernet ports, RS232, RS-485 and a micro SD card slot for storing records if there is no GPRS signal. Din-rail mounting and external wired antennas give a wide range of mounting capabilities to suit a variety of situations and environments. 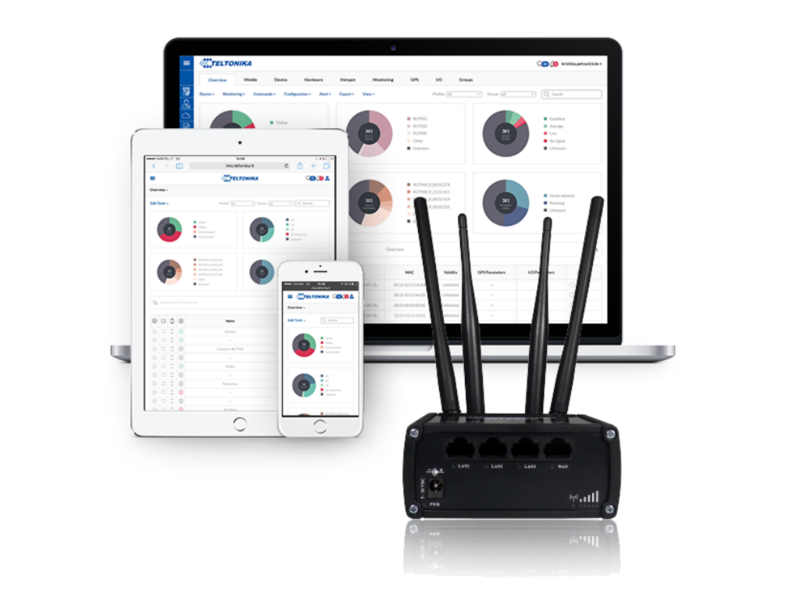 Teltonika’s Remote Management System (RMS) allows you to remotely manage your router’s fleet. With RMS you will be able to access, control and monitor all of your routers within a single platform. Each RMS license provides you with access to the system for one month per device, and you can purchase an annual subscription from us. This gives you 12 monthly licenses to assign to your device that will roll on from month to month, and are valid for 2 years after purchase. Check out our full Teltonika router range and order today.